The anaconda is the biggest snake in the world. Also known as the Water Boa, this giant, semi-aquatic meat-eater lives in swampy areas of tropical (warm) South America. It spends a lot of time in shallow water, hidden from unsuspecting prey. Anacondas are related to boa constrictors. They give birth to live young; 20 to 40 baby snakes are born at one time. : Like all snakes, anacondas are cold-blooded; they are the same temperature as the environment. They continue to grow all their lives, getting bigger and bigger each year. The longest anaconda ever found was 37.5 feet (11.4 m) long, there are probably even bigger anacondas that have not been seen. 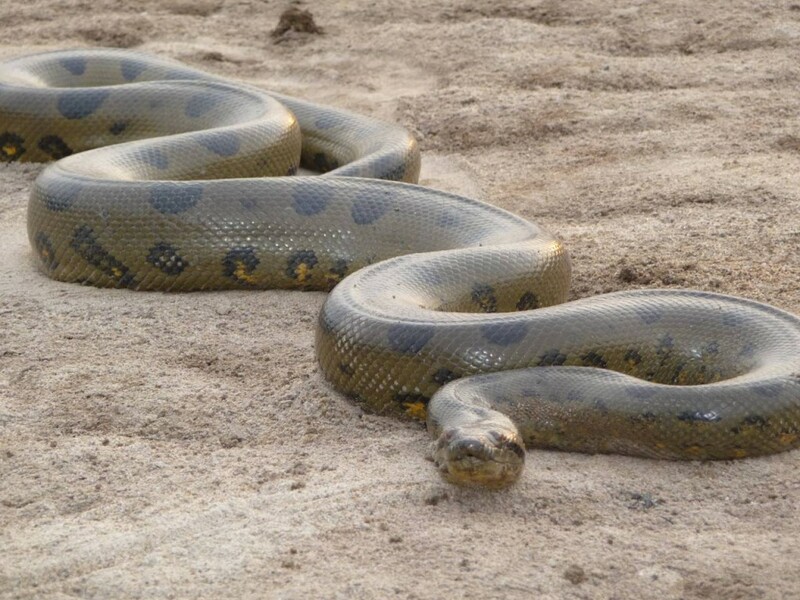 Anacondas are greenish-brown with a double row of black oval spots on the back and smaller white markings on the sides. Their scaly skin glistens but is dry to the touch. The nostrils are on top of the snout, letting the snake breathe easily when it is in the water. It smells with its tongue and has no fangs. Anacondas are carnivores (meat-eaters). They mostly hunt at night (they are nocturnal). Anacondas kill by constricting (squeezing) the prey until it can no longer breathe.